This instrument is designed to test the static pressure and flow capacity of a vacuum regulator to determine if it is suitable for clinical use. The suction regulator test device has a two-position switch for measuring static pressure (suction) and the corresponding airflow. When switched to position “A” (static pressure) the gauge measures the non-flowing vacuum pressure directly. 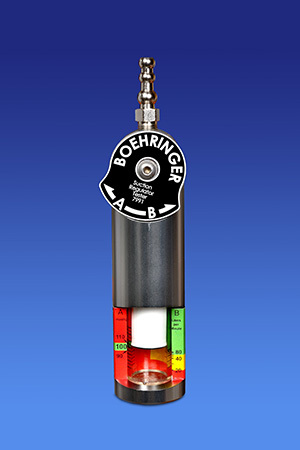 In the second position, “B” (airflow), the gauge indicates the airflow to provide a direct indication of the supply capability of the suction regulator when set to the previously indicated static vacuum. The suction regulator tester is calibrated at our factory. To maintain factory calibration, the orifice should be kept clean and free of debris. The instrument should be sent back to the factory for calibration every two years. We work in a friendly and efficient environment using the latest technologies and sharing our expertise to make superior medical products. Copyright © 2019 Boehringer Laboratories, LLC. All rights reserved.